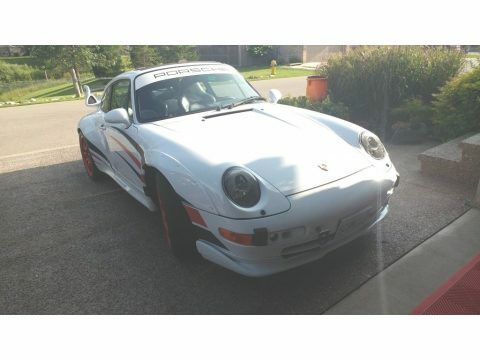 1997 Porsche GT2 Clone for sale in London, ON Canada N6N 1B4 Experience maximum driving pleasure behind the wheel of this 1997 Porsche GT2 Clone. This coupe has a Rebuilt Supercharged 3.8 L engine with a Rebuilt 6-Speed Manual Transmission. There are approximately 3,000 rebuild miles, total mileage is unknown. Shown here in Glacier White with a Dark Blue Interior, this Porsche is in excellent condition with 2 Owners. It has been garaged with a non-smoking owner. Other Features Dyno Tuned : Full Sequential Engine Management System Including Drive-By-Wire Fuel Feed This Bad-Boy Is Street- Tuned To 454 Hp @ Rear Wheels: Potential For Track Tune To approximately 525 Engine Is A 3.8L Supercharged by Rotrex, Rebuilt from Bottom End Up Billet Rods, Solid Lfters, Hi-Temp Pistons, and Top Ceramic Rings Latest Upgrade of Haldex Electronics, Installed And Custom Fit By European Trained and Certified Technicians Exhaust Special By Mand;M GMBH Transmission Rebuilt C/W Steel Synchros Torsion Bars (Adj) Installed Bilstein Adjustable Coil-Overs Tower Brace Big-Reds (Largest Possible) Engine Sits On Wevo Semi-Solid Mounts, Car Sits On ‘ O Z’ Light-Weights and Run On Zr Rated 235/295 ‘S. Head Lights Are Hi-Intensity Gt2 Xenon Front Dam Bolt-On Fenders Front Grill Oil Cooling System Rear Wing (Fully Functional) Installed By Techs To An ‘Oem’ Fit The Interior Has Gt2 3-Spoke With Hub Sport Seats (8-W) Pedal and Foot Plates Dash Is GT2 White-Faced Dials Short Shifter In C/Fibre Also Hand Brake Am/FM/CD Player with Stereo A/C Boost Gauge in Center Console Floor and Undercarriage Clean Free of Rust Or Damage Outer Body Clean and Has Original Paint and Finish No Accidents or Repairs Never Tracked In Its Reworked Condition, This Car Has Approx. 3000 Miles on It, Due To Gauge Changes and Some R + D Please call (402) 502-8385 for more information. ATTENTION BUYERS *Caveat Emptor* Please Remember to Inspect Vehicle Prior To Purchase!